quick post, and i'm off to my son's baseball game near LAX. went to the broiler the other day. actually got there early for a change. where the heck was everyone? i think i heard a lot of people were probably over at the show off alondra. oh well, took some pictures, said hello to the regulars, talked to another graphic designer who's been following my blog...actually had time to sit and wait to see if anything interesting or new drove up. saw this old chevy fleetline not long before i called it a night. owner was nice enough to come over and chat a bit. that's him on the right showing something to the japanese tourist. 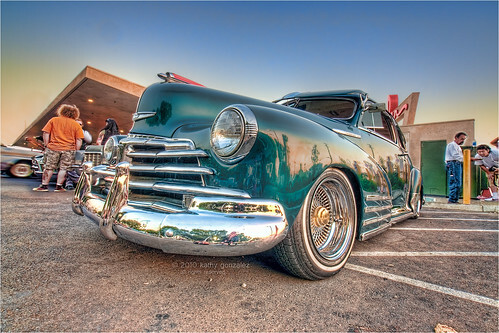 told me about another show down toward san diego at chicano park - only happens once a year, so maybe next year. oh and that tourist and his two buddies...everytime i turned around, there they were, taking pictures of the same car i was doing. got in the way a couple of times, actually. had to go find another car sometimes and come back to one i really wanted just to get them out of the frame.